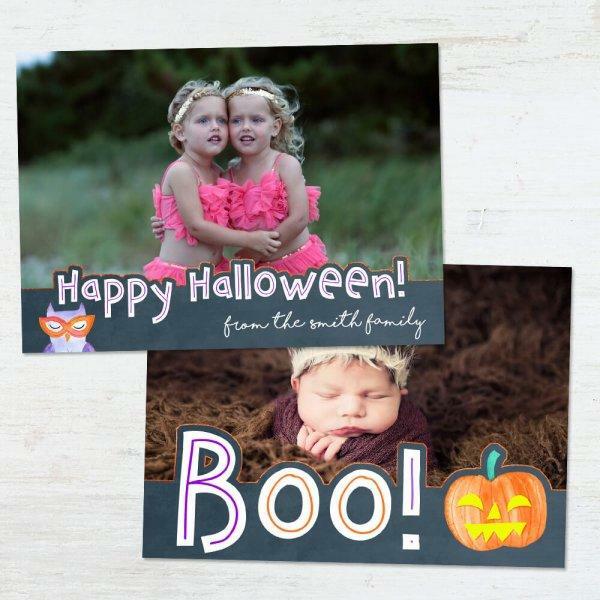 Cute and delicate card for your traditional Halloween Party with friends! A cheerful design for a thrilling Halloween Card Template for Adobe Photoshop! Enjoy the beauty of these Halloween card templates as you create superb, personalized greetings for your family and friends. Each of these templates from Sleeklens is designed for easy use and you can uniquely put your artistic skills to work while designing your own cards during the Halloween season. The good thing about these templates is that they are never monotonous and you can use them year in, year out and still enjoy unique results. You can print your flat cards or send the party invitations via emails or still opt to post them on the social media including Facebook, Instagram and Twitter among others. 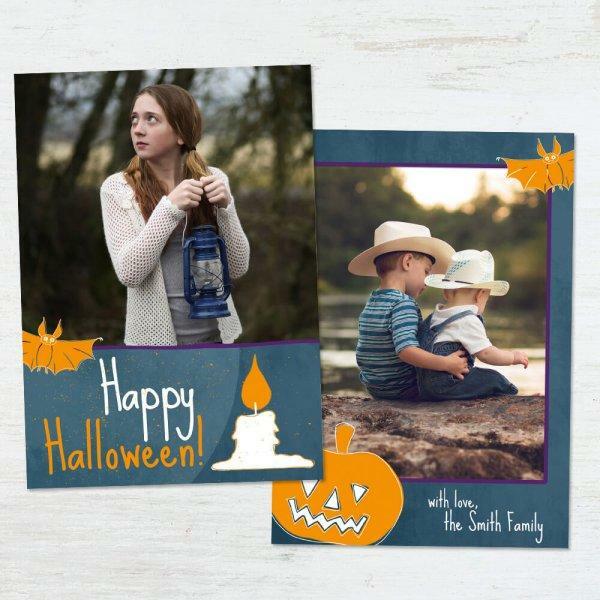 The card templates will help make your Halloween party a success as you spread a word to all your friends and family members in a personalized way. These templates are also ideal for professional photographers seeking for a way to make some money apart from their usual photography business. You can use them to design some lovely Halloween cards for your clients for a fee. This will help your studio to stand out as you give a unique and customized solution to your clients, right from the comfort of your studio. You can choose the template that best attracts you or goes for all of them since they are available at a remarkably low cost. Pumpkin Smash is one of the most notable Halloween card templates from Sleeklens. This template is designed in a way that makes your work easy and stress-free and you can create gorgeous cards even if you don’t have previous graphic design skills or experience. It is a flat card template with a dimension of 13 by 18 centimeters and offers both front and back file options to give you bigger space to put down your message. This template is designed for Adobe Photoshop and is compatible with versions CC, CS+ and Photoshop Elements 6+. With any of these versions installed on your computer, you can go ahead and order the template ready for installation. Make sure your images are ready as you will have the chance to add your own for a truly personalized feel. The text is completely editable and you will receive clear instructions to help you get started. A list of fonts to use is also sent to you as part of your download package. Enjoy the thrill of designing your own personalized Halloween cards with the help of this cute template. Designed for windows and Mac, the template is compatible with Photoshop Elements 6+, CC and CS+. As such, you will need to make sure that any of these has been installed in your computer before placing your order. This amazing Halloween card template has a measurement of 18 by 13 centimeters thus giving you ample space to work with. You can easily drag and drop your favorite images to the canvas or edit the text completely for as many times as you wish. Cute & Thrilling is designed for users with a distinct taste for excellence and people who are keen on details when it comes to business. You can use this template as a professional photographer to promote your business or just design cost-effective and exceptional cards just to show your care to your valuable clients. Anyone seeking for ready design can use this template to come up with personalized cards anywhere, anytime. Send special greetings to your lovely friends and family members with the help of this customizable Halloween card template. The adobe Photoshop template comes ready for use and all you need to do is insert your text and images ready for printing or sharing through emails or social media platforms. You can design cards and easily upload them online or print them in some of the big pro labs near you. This template is compatible with adobe Photoshop Elements 6+, CC and CS+ and works with Windows and Mac. You do not need an internet connection to design the card template once you download the package and this means that you can work with it from anywhere even on the train while headed to the studio or your mini sessions. This 18 by 13 centimeter template is an ideal marketing tool which you can use to either market your business by showing care and thoughtfulness for your clients or charge to design some cards for those looking for something unique. You can use this template to come up with captivating cards even without prior graphic design skills. Just order it and be ready with your favorite photos and greetings and see how easy and fast it is to come up with a print-ready card. This template is in Layered Photoshop (PSD) files of 300 dpi. It comes with unique and easy to use tools such as clipping masks which will be able to use when adding your images and resizing them. In fact, if you find cropping tools to be so boring and time-consuming to use, these clipping masks will make your work quick, neater and more like a child play. With the help of the clipping masks, you can drag and drop the images on the template and then resize them to fit perfectly without leaving any rough, unpleasant edges. Pumpkin Candy comes with a beautiful background but the images you see won’t be available when you download. However, you can achieve the same results using your own images. The text is also completely editable with the help of gorgeous fonts (you will receive a list of names for easier search and download) which are not included in the pack due to copyright laws. This flat card template comes with clear instructions to help you get started and you will undoubtedly enjoy every step of the designing process. Which front and back file options, you can express your heartfelt message in a few, touching and sweet words. 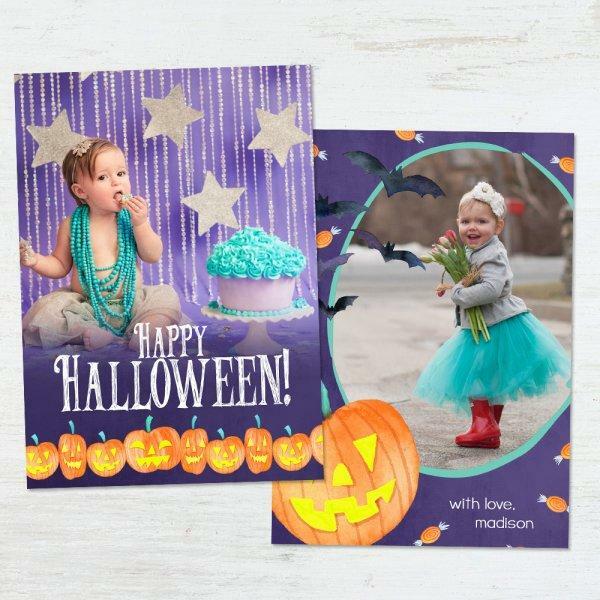 With these Halloween card templates, you can forget those boring cards from the store and design some which have your own personalized message and signature. Do it in a matter of minutes and put a smile on the faces of those who receive them.